I love the shiver-up-the-spine feeling one gets when in certain places, especially sacred places. 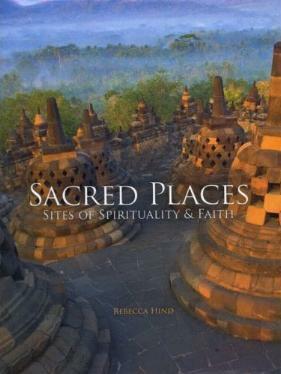 In this beautiful book you'll learn about the many varied places around the world that are considered sacred, no doubt where this feeling would be felt. One doesn't have to be religious as such to enjoy or experience these sacred and ancient sites. As it says in the Introduction, "For to ignore the past is to deprive the future, and in learning of ancient traditions we come to understand their evolution into current practice". The best thing about these places is that they can and do appeal to any faith, even though they may have originally been specific to one belief. Areas covered are The Americas; Europe; Africa and the Middle East; Asia, and Australia and the Pacific. You'll read about the ancient Maya structures (almost impossible to grasp), water at Niagara Falls, the stones as Castlerigg, Lourdes, Rapa Nui, Ayers Rock, Angkor Wat, the Pyramids, and a whole host of other exquisite places, all very dramatic and beautiful. Most places are extremely religious-based, and are to be treated and respected as such. Some photos I found remarkable appear on pages 41, 102/103, 167, and 226/227. Visiting at least one of these magnificent places will not only endure in your mind and soul, they will enhance your being. I think this sentence in the book, in a nutshell, says it all about how we all should live in our world: "If we can allow ourselves to embrace, learn from and work with those outside our own faith, then we can move towards the future with optimism and confidence". To me, it's that simple. Conclusion - Moving. Stunning. Evocative. Mesmerising. Glorious.